Yiddish refers to a primarily Germanic language containing elements of Romance, Slavic, as well as a mixture of Hebrew and Aramaic, which is written in the Hebrew alphabet. The language is thought of as having originated in the tenth century in the German Rhineland and from there spread through Bavaria towards the east and eventually became the vernacular used by Jews from France to Russia for over a thousand years. While a mixture of Hebrew and Aramaic constituted the language of the liturgy, commentary and scholarly work, Yiddish developed to be the dominant Jewish vernacular, as well as the language of media and press. 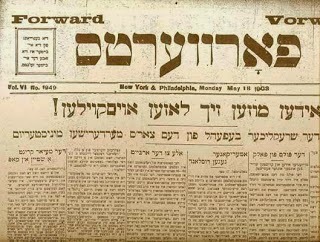 Towards the end of the 19th century however, the Hebrew language movement, supported by the growing Zionist movement, which increasingly adopted an anti-Yiddish stance, started implementing its agenda to increase the use of spoken Hebrew among Jews of all strata, both in Palestine and abroad. These efforts contributed to the growing tensions between religious and secular Jewish lifestyles, with many secular Zionists increasingly viewing Yiddish as antithetical to Hebrew, a word not only applied to a language, but also to a people. The Yiddish speaking ghetto Jew therefore had to be replaced by the "liberated, secular, Hebrew speaking homo hebraicus". Traditionally religious Jews, on the other hand viewed Hebrew as a respected holy language reserved for prayer and religious study and therefore insisted on speaking Yiddish. Yiddish speakers arriving in Palestine in the early 20th century had to learn that their mother tongue was more than just negatively connoted as in the 1920s and 1930s a literal war was launched against Yiddish culture and some militants even started bombing Yiddish printing presses, burned kiosks selling Yiddish newspapers and terrorised Yiddish speakers and writers: “Yehudi, Daber Ivrit!” (Jew, speak Hebrew!) exhorted placards carried by special “language defence” patrols. And yet, the suppression of Yiddish cultural activity through the Zionists apparently did not suffice to relinquish the language, which was in fact still flourishing and Yiddish and Hebrew newspapers were being read in roughly equal numbers in Palestine before 1948. Similarly, a large number of writers and poets still wrote and published their work in Yiddish. Out of the six million Jews who died in the Holocaust, 85% were Yiddish speakers. Though a considerable number of Yiddish speakers also survived the war, further assimilation in countries such as the United States, the extreme suppression of Yiddish culture in post-war Soviet Union through Stalin, along with the strictly monolingual stance of the Zionist movement, led to a sharp decline in the use of Yiddish. 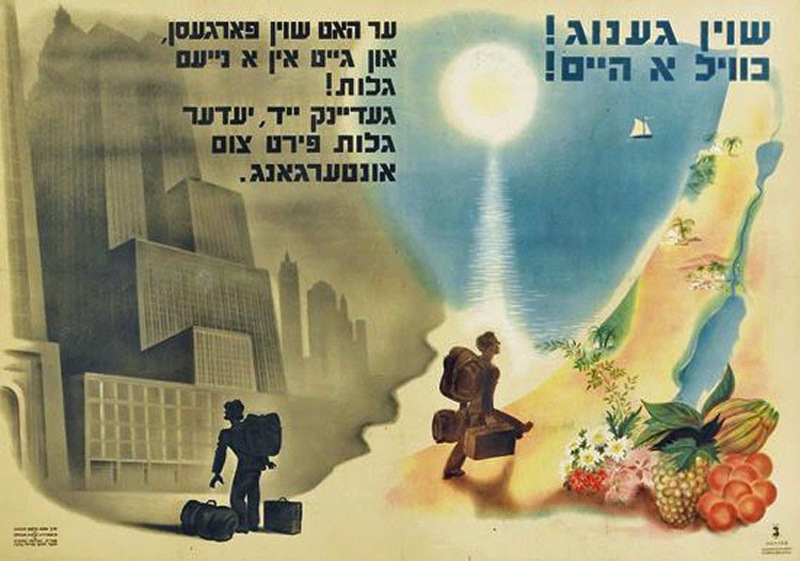 After the foundation of Israel in 1948, any attempt to revive Yiddish as a daily language, to bring it back to the streets was opposed by the Israeli establishment, however the creation "of a kind of small island of Yiddish culture, as a positive feature of the past, to be preserved, nurtured, and developed" was favoured by the policy makers and so a high culture in Yiddish developed "while a popular culture in Yiddish was relegated to the sidelines". Today there are an estimated 1,505,030 speakers of Yiddish, of which over one-third lives in the United States. Both in the US, as well as in Israel and other countries, it is mainly the Ashkenazi Haredi Jews, particularly the Hasidic Jews and the Lithuanian yeshiva world, who continue to teach, speak and use Yiddish. The largest of these centres in Israel are in Bnei Brak and Jerusalem. Today's popular use of Yiddish outside the Hasidic communities, is usually motivated by a desire for cultural continuity; or to connect to family roots; for others it is a conscious rejection of modern Israeli, Hebrew-language Jewish culture, often connected to questions of what contemporary Jewish culture constitutes outside of Israel. Probably the most important contribution to the persistence of popular Yiddish culture came from the US, more specifically from the klezmer revival. From the 1970s onwards musicians began to explore the music of Yiddish speaking communities in pre-Holocaust central and eastern Europe, with their interest soon also encompassing Yiddish dance, other folklore art and the Yiddish language itself. For artists such as Daniel Kahn and the Painted Bird, it was partly the transnational character of Yiddish, together with its defiance of spatial fixation, which fascinated him, and he started performing old revolutionary and partisan songs, thereby reviving and celebrating the subversive elements of Yiddish culture and history. A similar approach is taken by Kahn's Israeli colleagues and friends Oy Division, yet Yiddish is not only used in klezmer and cabaret music, but increasingly in different genres, such as hip hop and even heavy metal. So the years of Zionist suppression of the language could not relinquish the charme of Yiddish, which at least in Tel Aviv Yiddish seems to be alive and kicking. More and more cultural organizations are mushrooming, such as YUNG YiDiSH, a nonprofit which preserves and spreads Yiddish culture, or the Yiddishspiel, the Yiddish Theatre in Israel and more and more secular Israelis take classes in the language, so often proclaimed to be dead.